Who we are The IE Foundation is a non-profit organization that promotes the institution's core values by providing funding and financial support to the IE community. 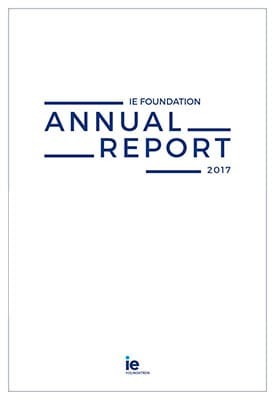 The IE Foundation was established in 1997. According to President Diego del Alcázar, its original objective was to “take whatever actions necessary to efficiently contribute to business development, and in particular, to benefit the least advantaged sectors of the population by promoting the incorporation of young people into business.” In the more than twenty years since then, the Foundation has worked to carry out this initial vision and expand its work to new areas. Geographically speaking, it now operates throughout Europe, North and South America, the Middle East, Northern Africa and Southeast Asia. Its resources are primarily dedicated to providing scholarships for talented individuals, funding research that broadens our collective knowledge, and sponsoring initiatives with a positive social impact. Making it possible for researchers to ask questions and search for answers. The research projects the Foundation supports are driven by a desire to explore new horizons, develop new ideas and promote new perspectives. We believe that promising students should not be turned away due to financial limitations. Our work isn’t limited to the borders of the IE campus. We are committed to supporting worthwhile causes and social initiatives around the world that maintain close ties with IE.